The subject line read Another Homeschool Tragedy. As I opened the email my heart grieved. Similar to other stories reported over the past year, it contained scandalous news involving a local homeschool father/spiritual leader. A man has fallen into sin. Families are torn up. Lives are devastated. Ministries are tarnished. The testimony and integrity of Christians are questioned. And, the homeschool community faces shame and disgrace. Opinions will always abound when scandals surface. Some will throw rocks at the accused. Others will call for grace. Some will claim that it was inevitable. Other will say they cannot believe it happened. 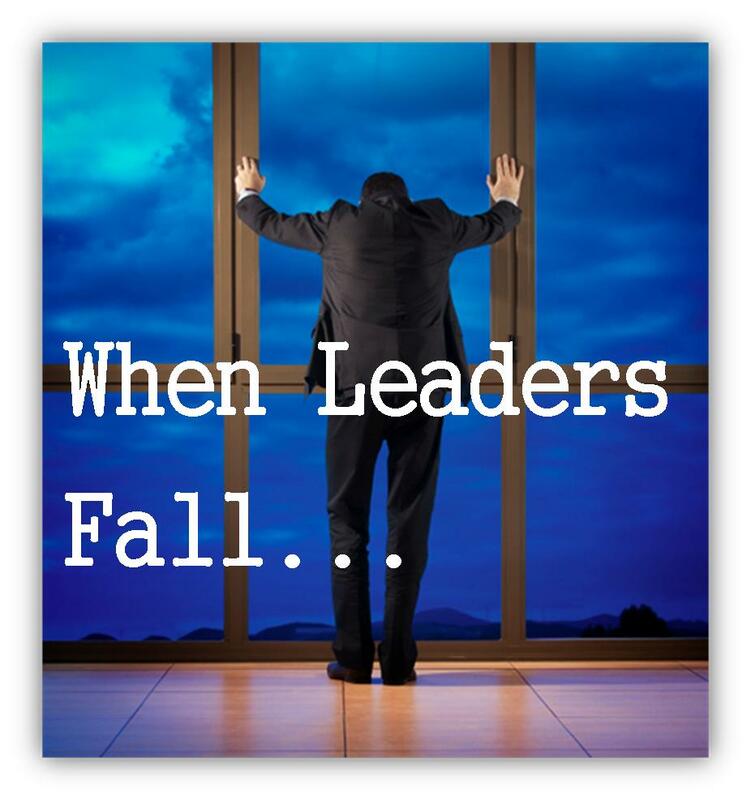 But placing opinions aside, there are things we can learn when those in leadership fall. After all, did not God give us examples in His Word of men and women who fell into sin in order that we can learn from them? Now these things were our examples, to the intent we should not lust after evil things, as they also lusted, 1 Corinthians 10:6. No doubt there are just as many examples of people doing wrong than right in the Bible. Keeping this in mind, there are at least four principles we can learn when considering this subject. As the old adage goes, a wise man will learn from the mistakes of others; an ordinary person will learn from his own; a fool will learn from neither. The first principle is something that we should already understand. It is not wise to accept at face value everything we hear second hand. We should certainly not believe every word we read on the internet. In this information age of blogging, social media and online news, the internet is to gossip as fuel is to fire. As a pastor, my husband counsels with many couples. Occasionally he will ask me to sit in on the sessions. Something that I have gained from this experience is that almost always there are three sides to every story – his, hers, and the right one. If this is true of face to face conversations, how much more should we be cautious of news traveling online? Negative news loves to spread, especially when it involves Christian people. The world is looking for a reason to criticize our faith. This is why a standard of living is so meticulously laid out for the church in Titus 2. God’s children are to look and live differently than the world with three reasons mentioned specifically in this passage. The first reason is so that the Word of God will “not be blasphemed” (verse 5). Another is that those who are “of the contrary part my may be ashamed, having no evil thing to say,” (verse 8). And finally, so that others “may adorn the doctrine of God our Saviour in all things,” (verse 10). We are to live “soberly, righteously, and godly, in this present world;” Titus 2:12. Unfortunately, Christians do not always do so. Believers need to walk circumspectly. We also need to speak with caution and be careful with our accusations especially when it involves a spiritual leader. On the other hand, we do not want to be guilty of hiding or covering up sins to the determent of others. Often, people will downplay the reality of what is happening or ignore it all together in fear that Christianity will look bad. When leaders fall into sin there is a warning in Scripture toward both ends. “Against an elder receive not an accusation, but before two or three witnesses. Them that sin rebuke before all, that others also may fear,” 1 Timothy 5:19-20. This is, of course, in context of a local assembly. When we hear news of scandal it is good to remember to not believe everything we hear. Also, when people fall into sin, note that it rarely helps to take those sins and magnify them before the world. Unless you are directly involved in the situation, often the best response is none at all. Silence is never misquoted. Since the beginning of time pride has caused sin, ruin, and heartache for mankind. It was Satan’s pride that caused his fall (Isaiah 14:12-14). Eve was tempted with pride when the serpent tricked her into believing that she would become as a god, knowing good and evil (Genesis 3:5). Our Lord was tempted with pride in the wilderness (Matthew 4:5-7). We are warned in I John 2:16 about the “pride of life”. Pride is such a stumbling block that one of the qualifications to be a pastor or elder is that he must not be a novice, “…lest being lifted up with pride he fall into the condemnation of the devil,” I Timothy 3:6. How many times have we heard of a man preach or teach against the very sin that he ends up falling into? (Being transparent here, how many times have I lectured my children about sin in their life to only have the same sin rear its ugly head in my life.) Pride tells us that we are untouchable. Pride dismisses accountability. Pride elevates man and pushes God far away. So given the warning of pride, when we hear of leaders falling into sin let it serve as a reminder to remain humble ourselves. “Wherefore let him that thinketh he standeth take heed lest he fall,” 1 Corinthians 10:12. The truth is that none of us are immune to sin. In fact, it is that very moment we begin to think that we are immune when we are at the highest risk of falling. People are people; nothing more. It is pride that tries to make more of man than he is. But lest we forget, God is God and nothing less. When we grasp this concept the pride in our lives become detestable and we are left in humility before the One who discerns of the thoughts and intents of our heart. Romans 12:3 warns, “to every man that is among you, not to think of himself more highly than he ought to think.” We fall into danger of temptation when man is elevated too high and no doubt this can become a problem. On the other hand, we see in scripture the concept of healthy emulation. God places people in our lives as examples to follow. Christians should imitate those of noble character. The Apostle Paul spoke to the church in Corinth saying, “wherefore I beseech you, be ye followers of me,” 1 Corinthians 4:16. To the Jewish believers he said to be, “followers of them who through faith and patience inherit the promises,” Hebrews 6:12. Speaking of pastors and elders, Paul wrote, “Remember them which have the rule over you, who have spoken unto you the word of God: whose faith follow, considering the end of their conversation,” Hebrews 13:7. We are to look to our leaders, consider their behavior, and follow their example. This is healthy emulation. The Apostle John gives the same instruction in his third epistle stating that we are not to follow after evil, but that which is good (3 John 1:11). In other words, imitate those who do good things. There is a balance. Extreme tenets almost always lead to problems. I have known those who will put a man or ministry on a pedestal, but then jump to the other extreme (complete disregard for any man or any ministry) when that man falls. I believe that we can find that balance in the local assembly, which brings us to the next point. The problem I see with online ministries and parachurch organizations is that while they do good works for the Kingdom, if we are not careful these organizations can easily become a surrogate for the local assembly. When the intimacy of the local assembly is replaced with a general or broad application, accountability is no longer possible. You see, the local assembly is not an organization, but an organism – a living body. Consider Paul’s instructions to the Philippians. “Those things, which ye have both learned, and received, and heard, and seen in me, do: and the God of peace shall be with you,” Philippians 4:9. Paul had already told the Philippians in 3:17 to be followers of him, now he reminds them again. Do the things that you have not only learned, received and heard from me, but also those things that you have personally seen in me. Paul practiced what he preached and those in Philippi could verify his words because they had seen the way he lived. It is hard to follow someone solely based on their bio. This is why the local assembly is important for healthy emulation. We need to witness the walk of those we look to for examples. I certainly do not want to discount all works and resources outside the local assembly. That would be foolish. Many ministries provide valid support for believers. Many organizations and leaders greatly influence others in the Christian community. I am thankful for the wealth of books and tools that are available for Christians and the homeschool community. These resources have personally brought value to my life over the years. I have written books to the Christian community as well as the homeschool community. But the bottom line is that while books can be a great resource, they are no substitute for the Word of God. And just as resources are no substitute for God’s Word, ministries or organizations should not be a substitute for the local assembly. Thousands upon thousands of men and women are faithfully and silently serving the Lord. They are placed in our churches as examples to follow. There are spiritual leaders who set a good example to follow, families who are living out godly principals, and parents that are bringing up their children in the nurture and admonition of the Lord. Look to the local fellowship for support. Personally know those who you follow. Be an example for others to follow. And welcome accountability that can only come from a local fellowship of believers. News of scandal brings concern and uncertainty to our community. But like all things, good can come from it. When news travels remember to not believe everything you hear. Let it serve as a reminder to stay humble before the Lord. Understand the importance of healthy emulation and the need for the local assembly. “Wherefore comfort yourselves together, and edify one another, even as also ye do. And we beseech you, brethren, to know them which labour among you, and are over you in the Lord, and admonish you; And to esteem them very highly in love for their work’s sake. And be at peace among yourselves,” 1 Thessalonians 5:11-13.